ANYWAY -- clearly I'm fired up. I'm still sorting through travelogues, vlogs, and blogs of our amazing tour in the United Kingdom. But rather than post those today, I thought I'd share some links. Speaking of Emily, she's just started a YouTube channel called The Patient Perspective, where she produces videos for patients undergoing extensive medical care. Current topics include "How to Survive a Long Hospital Stay" and "What to include in a care package for someone who is in-patient for chemotherapy." So many of us have loved ones going through cancers and other awful diseases, and this channel provides some new perspective and answers many questions. My mom started a new chemotherapy regimen last week, and here is her CaringBridge website. MORE CHEERFUL links!!! This cancer talk is bumming me out, so how about some stuff that has nothing to do with cancer. Like, my friend in England has this magical talent of starting businesses out of every hobby she picks up, from songwriting to cake design. 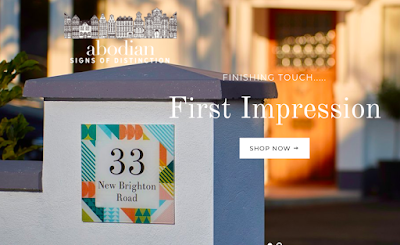 Here's one of her companies, Abodian Signs, a shop that makes beautiful signs for European homes. You can order one to America, but check your local ordinances to make sure the numbers are large enough (my city requires 4" numbers, which don't fit on a sign because my house has 4 digits). Tara Anderson's podcast, "Five Things," is fantastic. If you're in Louisville, you know about it already, but if you're not, there's a small chance you haven't heard of it yet. Candythief, aka Diana de Cabarrus, is releasing new music. I have the album already because I am a Kickstarter/crowdfunder backer. You can get it soon, and if you're in Edinburgh, you can attend the CD launch party on March 30. Usually I'm pretty good about re-entry. It's the exit that proves difficult for me -- I'm constantly flitting about making sure I have every little adapter and merch and cable and instrument packed, while balancing a baby attached to my leg and a hungry 5-year-old whose goggles are missing. It's hard to just go out to a gig. Coming home is generally easier because the gig is over and MOMMY'S HOME! This time, however, I was gone for two weeks. I played at least one show a day -- often two or a radio appearance -- and it was FANTASTIC. Steve and I had a blast. We didn't fight, and I'm pretty sure he only got annoyed with me when I told him he got too close to the parked cars or when I reminded him to look right first on a roundabout, which I suppose I did daily, but, hey, we are still alive, right? Anyway, being gone for two weeks got me in this groove -- a groove I'd forgotten I had in me. It was wonderful. I barely thought about the kids for the first week (not supposed to admit that, I know, but hey, I'm nothing if not honest), and it was amazing to be sharing my art with the world. Someone asked me early in my career what my goal was. It was always fairly straightforward: I want to travel the world, singing songs I wrote for people who care and provide them with a smile. I got to do that for two straight weeks, and it was perfect. Coming home was a challenge. I got in bed around midnight after flying all day, and David left the house to catch his plane at 5am. I was back into solo parenting straight away, and I was TIRED. I have three more weeks of this, however, until our au pair arrives!! I cannot begin to explain how excited I am to have another member of the family -- an auntie for the boys, a co-parent for me, a friend, and a helping hand with the kiddos. A little video of country roads, Roman villas, and pheasants that don't want to live. We left the Cotswolds before the sun rose on Wednesday morning, as it was a 3-hour drive to Cambridge and we had to be at the BBC Radio station before noon. It’s only 150 miles or something, but traffic is always bad, particularly around Oxford, so we got an early start. We’d been up since 1am in Cirencester having a great chat with The Black Feathers, so it wasn’t pleasant waking at 6:30a for a drive. Tis life on the road, however, and it’s still significantly better than touring in America. A 3-hr drive here is considered a long travel day, while on American tours, it’s typical to drive 8-12 hours to the next gig. I like to leave time to explore the towns, pull off for historical markers, and enjoy a cuppa. 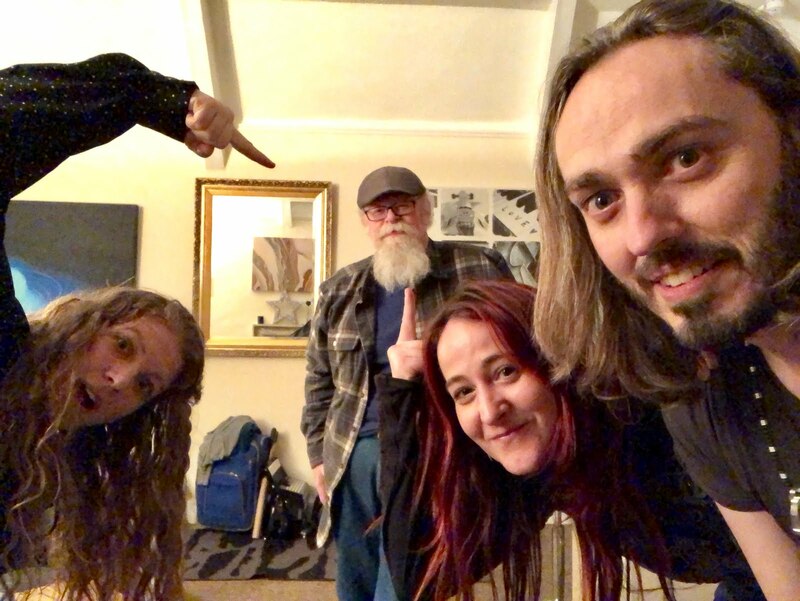 After playing 3 songs and doing an interview on the BBC Cambridgeshire with Jeremy Sallis (who is absolutely delightful, as is his cohort, Glenn! ), we arrived at the Six Bells pub, run by Eileen and absolutely wonderful woman. She was reading a novel in her pub and popped across the street to show us our rooms. I spent the afternoon meandering medieval bits of Cambridge and getting lost among markets and cobblestones, entering the imposing King’s College Cathedral, seeing the dark oak wood carvings of Henry VIII (I particularly liked the H+A carvings, like Henry + Anne = LOVE 4EVA UNTIL I CUT OFF YOUR HEAD!). The stained glass was amazing, and I still don’t understand how any of those massive buildings actually got built, even though I’ve read Pillars of the Earth. Later, I enjoyed some great conversation with Eileen and then met up with an internet friend, whom I know from a UK Mums Facebook group. She’s American, but has been in the British Isles since 2002. Also, she’s a redhead with two kids and she’s a crunchy-type momma too (and a brilliant urban planner), and it was great fun meeting her in person. The Six Bells is a small pub and we packed it to the gills. Steve and I played semi-acoustic, with just a vocal mic, so I wouldn’t have to scream over the banjo. The large crowd went silent as we played, as the uber-polite English audiences do, and we just had a blast playing a long set of original tunes. We mingled and made friends and then played a shorter set with some singalongs and requests. It was a grand evening, distracted only by the fact that my phone was blowing up with some stressful stuff back home (we have a house on the market, and of course, everything happens when I don't have a minute to deal). BBC Radio in Cambridge with Jeremy Sallis. King's College Chapel stained glass. I loved this. So OLDE! 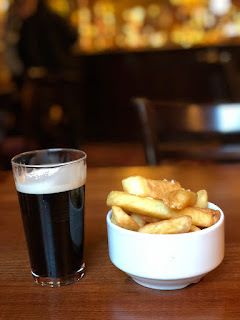 The Six Bells pub in Cambridge -- delightful. A room in the Six Bells pub! There’s a mystery series I love called Agatha Raisin by MC Beaton. They are quick reads with nothing terribly scary, and they are set in a fictional village in the Cotswolds. As Steve and I played in a played in Cirencester (a Cotswolds town - well, city, not village), I liked to pretend I’m a private detective. It was particularly fun driving through these village towns and trying to imagine which one is most like the fictional village of Carsley (I’m thinking it’s Barnsley). Cirencester seems off the beaten track to many English folk we encounter, but I first went there in 2008 when I met a friend on Couchsurfing (remember Couchsurfing?!). He’s continued to be a friend, though he has since moved to Bristol (it’s Neil, from my first tour blog!) and I continue to go to Cirencester, about an hour from Bristol, whenever I can. After an attempt at visiting the ruins of a Roman villa (it was CLOSED for winter when we arrived and the caretaker said, “don’t tell me — you looked on Google and it said we were open” — um YES?! If this happens all the time, perhaps you should change your hours on Google? ), we headed for the venue. We played in a pub called the Golden Farm, which has a perfect music venue attached to it. The building is 15th century, with a “new" addition built in the 17th or 18th century. The Vaults is the music venue, and WOW, what a room. The sound was fantastic, and our hosts for the evening were delightful — as they always are. The Black Feathers, whom some of you have actually MET when I hosted a house concert for them in Louisville last fall, are Ray and Sían and they are just the nicest and smartest and most talented people you could ever come across. They live above the pub, and we stayed with them. I was in the attic/music studio and stared at rafters from the 1400s as I drifted off to sleep. In the afternoon, Ray and Sían took me for a quick tour around town to see winding cobblestone streets, old churches, and the tallest hedge yews in Europe. Our friends, The Layers, opened the show for us at the Vaults, and we got to hear some rocking’ 3-part acoustic harmonies and excellent original tunes. 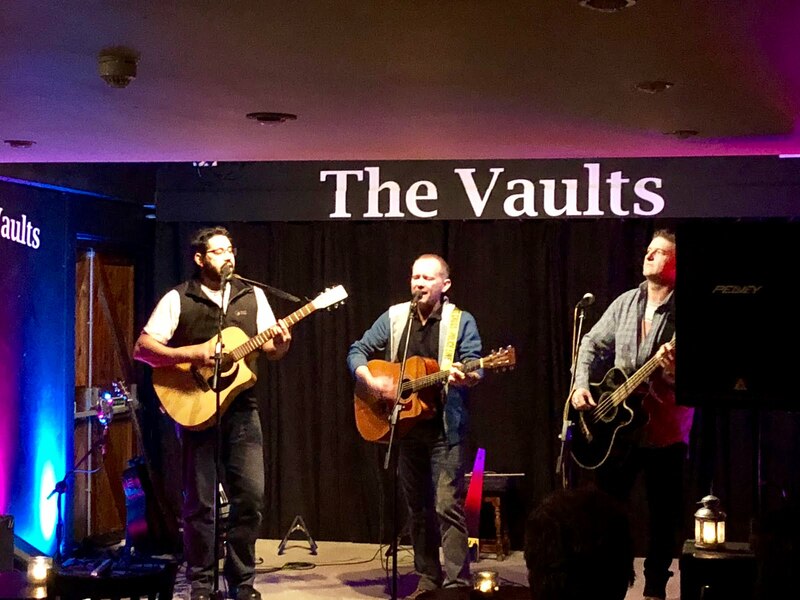 Thank you for sharing your gifts, The Layers, and thank you to all in Cirencester who ventured out on a Tuesday evening to hear live Kentucky music. LEGO recreation inside St. John's in Cirencester. Delicious feast prepared by Sían during soundcheck. Aneil! He came all the way from Wolverhampton. Kentucky has horses and Chicago cows).